Do you live with chronic pain in your lower back? Do you find yourself taking painkillers on a regular basis to treat sharp pains in your neck or upper back? If you are living with back issues, it can interfere with your daily life on multiple levels. Fortunately, the spine treatment center ProMed SPINE in Beverly Hills has the expert medical team you need to effectively treat a wide range of spinal conditions and issues. Whether you have been diagnosed with a spine injury, deformity, infection, or degenerative disc disease, the Board-certified spine and neurosurgery experts at our center can provide the comprehensive care and treatment you need.To learn more about the best hospital to have spine surgery in Beverly Hills, please make an appointment with our facility. Our Beverly Hills office is located at 436 N. Bedford Dr, #202, Beverly Hills, CA 90210. The dedicated medical team at ProMed SPINE has extensive training and experience performing minimally-invasive spinal surgery for a wide variety of back conditions. Our spine doctors always reserve surgery as the last possible resort in order to protect each patient’s quality of life by avoiding unnecessary operations. However, if spinal surgery is necessary, our team is highly skilled and renowned for our abilities in minimally-invasive surgery. Using small incisions and custom endoscopic cameras and specially designed instruments, our surgeons are able to treat even the spine issues without having to damage surrounding tissue or muscle. 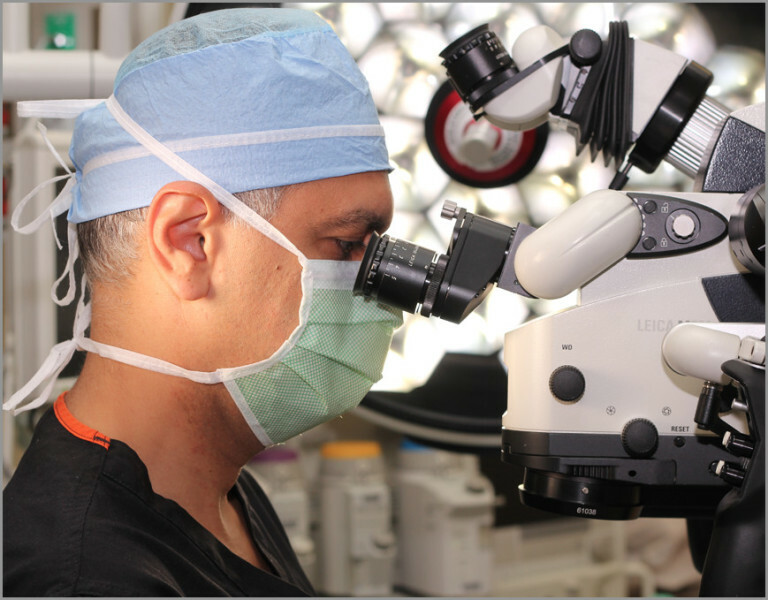 Dr. Gravori and his team also incorporate laser and robot technology to perform in very miniscule, hard-to-reach areas of the spinal column. Laser spine surgery has revolutionized many life-changing operations, such as cervical spine surgery, thoracic spine surgery, and lumbar spine surgery. However, it takes immense experience and skill to perform any type of surgery on the back, as there are highly sensitive nerves as well as the spinal cord to protect. Our surgeons take the least invasive approach possible to ensure that patients regain as much normal function as possible, as well as effective pain management. To learn more about back surgery, please visit WebMD.com. When it has been determined that surgery is necessary to correct your spinal condition or injury, it is crucial to work with a surgical team that not only has a proven track record of success in performing your operation, but also has a respected reputation for providing the highest quality patient care. At ProMed SPINE, patients and their families have the comfort and confidence of working with back surgeons who understand that surgery can be intimidating and will take the time to provide the information and assurance necessary to help patients throughout the process. Since spine surgery is always the last resort, we take the time to find whether conservative treatment options will be the best treatment option and then work closely with each patient until the appropriate method is found. Situated in the heart of Beverly Hills, our spinal facility is within easy access to five-star hotels, world-class restaurants, and upscale shopping opportunities that are not to be missed! Whether stopping in for a consultation or undergoing a crucial medical procedure, our patients can enjoy the relaxation and diversion that Beverly Hills has to offer. We strive to ensure that our patients have a stress-free experience and are more than happy to handle travel and accommodation plans for our patients as well as pointing them in the direction of the most popular attractions in our neighborhood, such as Rodeo Drive, the Greystone Mansion, and the Beverly Gardens Park. From luxury spas to celebrity sightings, Beverly Hills is an ideal location to unwind and explore. We understand that conservative and surgical treatments for neck or back pain can be stressful, but our helpful staff will go above and beyond to ensure that your experience is as comfortable and accommodating as possible at our facility or out and about in Beverly Hills. Don’t go another day living with pain or limited mobility. The spine specialists at ProMed SPINE can provide the answers and treatment you deserve to improve your quality of life and regain freedom. Neck or back pain can become debilitating, but there are countless treatments available. Whether you will benefit from physical therapy, artificial disc replacement, or any other type of spinal surgery, our team can help. To learn more, please schedule a consultation at our Beverly Hills office today! Next, read about spine surgery in Encino.